More stable and easier to handle than traditional two-wheelers, three-wheelers -- like the Can-Am Spyder RS (above) -- are catching on. FORTUNE -- "Did ya take your training wheels off yet?" Movie buffs may flock to Sundance for the film festival and antique auto enthusiasts throng the Monterey peninsula for the annual classic car show, but nothing compares in scale or commotion to the mass of bikers who attend the Sturgis Motorcycle Rally, the 72nd edition of which blasts off this year on August 6. Besides taking over five downtown blocks of the small (pop. 6,600) South Dakota town to display their machines, the more than half-a-million attendees will spend a week at shows and concerts, participate in organized rides and informal races, and hang out with their fellow bikers. New this year at Sturgis -- and threatening to some of the attendees -- is the growing presence of motorcycles that have three wheels. More stable and easier to handle than traditional two-wheelers, they are catching on with riders who because of infirmity, inexperience, or age are unwilling or unable to throw their leg over the saddle of a regular motorcycle. Three-wheelers are becoming so popular they are generating some friction in the biker community. As Steven L. Thompson, a columnist for Cycle World, observed, "a lot of motorcyclists apparently think it's some kind of affront to motorcycling -- a slap in the face of "real" motorcyclists." Stand in the way of progress and you are likely to get run over, whether it is by two wheels or three. Sturgis attendees can examine two different approaches to three-wheeling. Harley-Davidson (HOG, Fortune 500) will be showing its Tri Glide, which uses the one front-wheel/two rear-wheels setup that is a longtime police favorite. In perhaps an ironic reference to Harley's macho image, the Tri Glide is known as a "trike." More radical is the entry from Can-Am, a unit of Quebec-based Bombardier Recreational Products and Vehicles (BRP). Called the Spyder, it sports two wheels up front and just one in the rear. Easier to steer than a two-wheeler -- you turn the handlebars instead of leaning -- it has been remarkably successful in luring new riders. Some 27% of Spyder owners have never previously owned a motorcycle. These two solutions to the same problem saw light in different ways. The present-day trike was created in 1984 by a backyard entrepreneur named John Lehman. Working out of his home in the rural community of Westlock, Alberta, Canada, Lehman adapted a Honda Classic motorcycle for his wife to ride. Lehman promptly traded it away, but the following year he built another motorcycle conversion and decided to go into the business building custom three-wheelers. At first he worked only with Hondas, but in 1991 he converted his first Harley. Lehman Trikes went public in 2001, and a year later it opened an assembly plant in Spearfish, S.D., where it eventually established its headquarters. When Harley decided to go into the trike business for itself in 2008, it contracted with Lehman to provide paint, parts, and conversion services. The arrangement continued until 2011 when Harley moved trike production in house. The trike in Harley's 2012 lineup is the Tri Glide Ultra Classic, which it colorfully describes on its website as "the ultimate badass touring machine." The massive bike weights nearly 1,200 pounds and is rated for 80 pounds of cargo. But since it has three wheels, there is no need for the driver to balance all that weight when he makes traffic stops. The Tri Glide Ultra Classic starts at $30,499 and costs as much as a midsize car, but that hasn't stopped its rise. Sales grew 11% in 2011 vs. 5% for two wheelers and are up another 27% this year, making the Tri Glide the sixth most popular Harley model. Can-Am's three-wheeler has an entirely different DNA. After BRP was spun off from Bombardier Inc., the Quebec-based maker of Ski-Doo snowmobiles, Sea-Doo watercraft, and other recreational vehicles was taken private in 2003 and remains half-owned by Bain Capital. Four years later, it found some white space in the personal vehicle market where it could use its ATV know-how and created the Spyder. Explains a spokesperson: "We saw an opportunity to go after the non-nons: People with no experience with motorcycles or power sports vehicles." Introduced in 2007, the two-plus-one design of the Spyder was so unusual that Jay Leno took delivery of the first one. 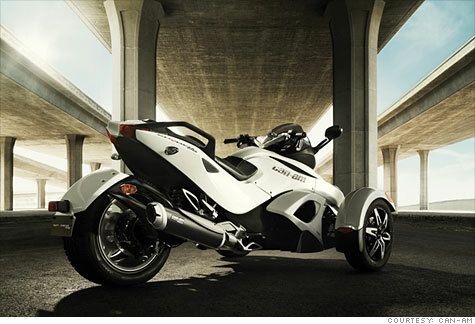 Spyder sales rose 50% in 2011, and BRP now ranks sixth in U.S. cycle sales. The vehicles come in two flavors: the sporty RS, which designed for one person, and the more sedate RT, which accommodates two and is designed for long trips. Unlike the Harley, Spyder was not adapted from an existing vehicle but was engineered from the ground up. It is equipped with modern safety features like traction and stability control and anti-lock brakes. Prices start at $17,000 and go up to $25,000. Although cries of "lose your training wheels" are still heard, longtime bikers are beginning to come around. There are thrills aplenty, no matter what you are driving. As Cycle World's Thompson points out, "Ride anything with two or three wheels into the world populated mainly by armored and air-bagged cages, and you ride naked, more or less. Be caught by a left-turning SUV, and it doesn't matter if you're on a Harley or a Spyder." In some ways, three-wheelers raise the adrenalin level even higher. New riders are warned to be careful when attempting to split lanes of traffic; maneuvering three tracks of tires rather one than shrinks the margin of safety rather drastically.